Morwhenna. 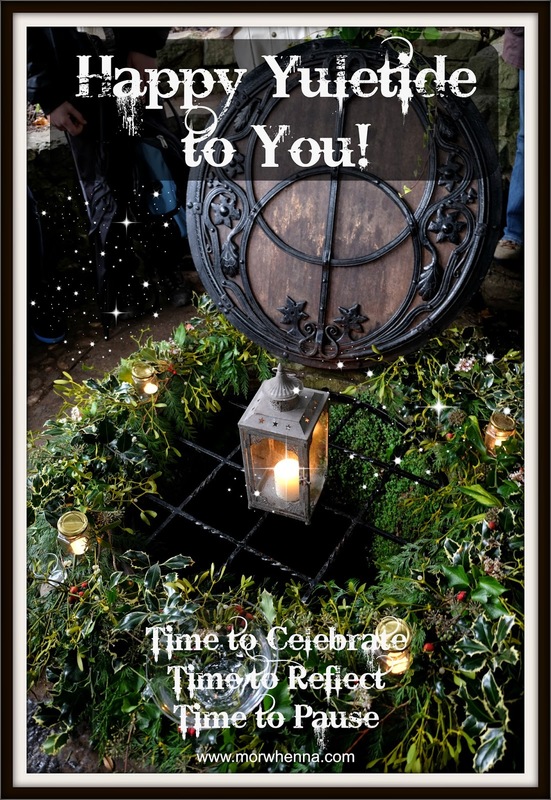 The Creative Adventurer: Happy Yuletide to YOU! Happy Yuletide to YOU! As you may know, Yule or Winter Solstice marks the longest night of the year. From this point on we can delight in the nights as they grow shorter and the days as they grow longer, and winter begins to recede. This ancient festival celebrates the return of the sun, the light in the darkness. Colour features highly in this celebration, from the reds and greens of the leaves and berries that are brought in to remind us that green life and warmth will return to the land; and bold colour contrasts such as blue and silver or black and gold said to represent the forces of day and night. Today I visited The Chalice Well in Glastonbury for their Winter Solstice Meditation. It was the first time I've been to one of their events and it was wonderful. It was very busy and yet at the meditation around the well head at 12.00, there was such a feeling of stillness and peace. During the guided meditation we were invited to visualize returning gold to the waters. A very clear image appeared in my mind of everyone standing around me completely made of golden flowing water and as the meditation progressed threads of gold flowed from each of us in to the water and lit up the well. Wow! This was an invitation that came from a tribe who live high in the mountains of Nevada (I think that's what they said!) and they have put a call out to the world to send gold back to the earth to energize her. I have realised that it's much more useful for me to switch to seeing the the 21st as the longest night which speaks of possibilities as opposed to the shortest day which speaks of lack. This is a time of rest, reflection, renewal and planning, as well as a chance to celebrate all that nature has brought and taught us this year. Pause for a while. Even for 2 minutes. Christmas Wishes & Stockings Full of Joy!